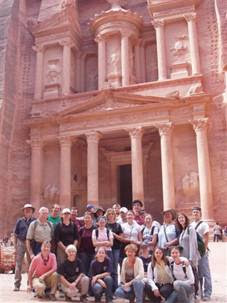 This summer, APU is organizing a study-abroad trip to Israel. It’s a five week trip. Three weeks will be taken to tour Israel (with Dr. Mullins as our guide) and another two weeks will be an archaeological excavation at Tel Rehov (I believe it’s a Neo-Hittite excavation which was first dug up by the Germans in the 20s and we’re going to build on their work and possibly seek to critique it… I could be totally mistaken about the site though). As you could guess, I am thoroughly excited. One thing I forgot to mention… the trip is going to cost about $5,000 and I don’t have the money. I believe that this is a once in a lifetime opportunity, especially the excavation, and a perfect end to my undergraduate education at APU. As of now, I believe that this is a trip I must go on, but I am unsure how I am going to pay for it. So, if you think of it, pray for me and pray that I am making the right decision. I must decide before November 30th. I'll see you there my friend!